There are 2 posts filed in Redecentralize (this is page 1 of 1). Why reading news from Facebook is dangerous for you and your society. Here I explain why it is dangerous to see the world through the window of Facebook, Twitter, or other “smart feed” websites. I’m not claiming that these social networks deliberately divide societies and distort your understanding of the world. However, I show that this is the unintended consequence of their business model. At the end, I propose some alternatives that you can try for yourself. Is it Facebook, or is it the page I follow? We used to get our news directly from journalists, i.e., from newspapers and lately from the websites that they run. Increasingly, however, we get the news from social networks like Facebook and Twitter. Effectively, we don’t find news anymore; we wait until the news find us in our Facebook or Twitter feeds. While journalists are supposed to adhere to the principles of fair, accurate, and unbiased reporting, these social networks don’t have such principles. In contrast, and according to their business model, Facebook and Twitter are advertising companies. I’ll come back to this important point later. Let’s be clear. If you follow the page of, say, The Guardian in Facebook, you’ll see Guardian’s articles in your home feed. But imagine you don’t check your Facebook feed for half a day. When you come back, which of the many posts from The Guardian come to the top for you to see? Do you see posts from The Guardian, or from other pages you follow, or from your many friends? Who decides which ones, and in which order? It is clear that Facebook cannot and does not show you everything. There must be a “smart-feed algorithm” that decides which posts, among hundreds of possibilities, come to the top of your home feed (and no, they don’t come in a simple chronological order). If Facebook can choose which Guardian posts you do or don’t see in your news feed, it is fair to say that you are somehow subscribed to Facebook, not to The Guardian. This algorithm is so powerful, that it is shown to be able to make you happy or sad just by tweaking which friends’ posts they choose to show in your home feed (Ironically, this study was done by Facebook itself). Isn’t that about showing the best content to me? As with any other ad-funded company, Facebook wants you to spend more time on their platforms, so that they can sell more “ad impressions.” This forces Facebook to show you things that you like more and share more, because, otherwise you might just leave! In Facebook’s terms, your “like”s and “share”s mean money. Exactly because of this market pressure, Facebook doesn’t show you posts which, in their opinion, could make you bored or disappointed. More importantly for us, if a news article is not compatible with your current beliefs and makes you feel uncomfortable, Facebook simply doesn’t bring it up in your home feed. Therefore in Facebook, what you believe is amplified, and what you don’t believe you never see. As strangely as it may sound, this mechanism can detach you from the society and deepen mistrust between you and the people who have different beliefs than you. This will make it harder for you to have a conversation with someone with a different religion, political affiliation, or even personal trait. This is part of the reason why some recent elections in developed countries had surprising results for many of their citizens: People were only reading news items that confirmed beliefs they already had. They virtually lost contact with the other parts of the society. As the Yiddish proverb says, “A half truth is a whole lie.” So Facebook is, unintentionally, lying to you. Because of what I have just explained, I find it personally irresponsible to expose myself to any smart-feed website regularly. As a result, I look for alternative ways to learn about the outside world. Below is a list of some of the things I do in this regard. I invite you to do the same and/or to share your alternatives. Stop “reading news” from Facebook. If you use Facebook, Twitter, etc., strictly limit it to your close family (also see the last point below). Stop following politics and other things about the outside world that you want to be informed about. Get your news “un-flitered” from news websites. Either by checking the websites directly, or by using a feed reader and subscribing to the website’s RSS/Atom feed (here is a handy list of some feed readers). Of course you will be taking care of following at least a few (preferably opposing) news agencies so that you have a chance to get a complete picture. While you have your feed reader set up, follow some blogs! There are many people who regularly write great blog posts about every topic you can imagine. Try to change your media-consumption taste from reading 5-second-long notes on social media to reading well-thought, 5-minutes-or-more-long blog posts. It requires some discipline at first, but it’s totally worth it. Be more active about what you find on the Internet. Set up a “read-it-later” service to save random interesting pages on the Internet that you’d like to read later (here is a handy list of some read-it-later services). Many of such services offer offline support, so that you can read the pages even without Internet access. When you make such a carefully curated list of interesting web pages, you are more likely to spend your daily commute in the train reading some high quality publications instead of erratically scrolling on your Facebook or Twitter feed. If you have read all the way to here, then I think we have something in common that we can discuss 🙂 . I’d love to know about your opinion and experiences on this topic. Please write your thoughts below. If you use Dropbox to sync files between your devices or to share them with your friends, you should seriously think of switching to Nextcloud. Here I give you three practical benefits that you get if you migrate your files to Nextcloud. But first, I should tell you what it really is. Nextcloud is a collection of computer programs that make it super easy for you to sync and share your data anywhere and in any way you want. You can think of it as Dropbox, except that you would be the CEO of Dropbox, Inc: It’s you who sets the rules on how much storage you get, where you sync your files, and how the desktop and mobile apps look like. If this is too much control that you don’t want to be hassled with, no worries! Nextcloud gets you covered as well. Because you have all your options on the table. You can use Nextcloud storage from your company/university/school, you can set up your own Nextcloud server, or you can choose from many companies that provide Nextcloud services for free or for highly-copetitive prices. But is it any better than Dropbox? Keep reading to see it for yourself. Whether you are a student or you work, chances are that your school or organization already has a Nextcloud instance running on their internal severs. Just ask your IT help desk if they offer Nextcloud storage, and you may be surprised! In Germany, where I live, an increasing number of schools, universities, and companies offer such storage to their students and employees. I myself got a hefty 50GB of storage from the very fast servers of my research institute, and many of my friends have similar plans (ranging from 30GB to 100GB) from their universities. Even if your school or company doesn’t provide that for you, it is easy to find Nextcloud providers that offer free storage plans ranging from 2GB to 5GB. And since the Nextcloud apps support multiple accounts on the same device, you can simultaneously use different providers to get as much storage space as you wish. Finally, if you are savvy enough to set up your own Nextcloud server (and it’s not really difficult), or you already own the beautiful Nextcloud Box, you can literally connect an external hard-drive to your Nextcloud server and use its full capacity to sync and share your files. While with Dropbox you can only sync and share your files, Nextcloud gives you the option to sync your calendars, contacts, tasks, SMS messages, Notes, bookmarks, RSS feeds, and…​ the list goes on. In fact, the Nextcloud project provides an open API (Application Programming Interface) for software developers to make Nextcloud Apps; extensions that add new functionalities to the core Nextcloud platform. Recently, they announced Spreed.ME, a video/voice chat app for real-time communications inside the browser, and also Collabora Online, an online office suite based on LibreOffice. With Nextcloud, you can simply enable apps to add new functionalities for storing and sharing all kinds of your data. With centralized services like Dropbox and Google Drive, you can only share your files with people who are on the same service. And if you need to share your Dropbox file to a Google Drive user, you usually have to make a public link and send it around. However, anyone with the link can access the file, which is a security risk. Nextcloud solves this problem by a concept called federation, where users from different Nextcloud servers can seamlessly exchange files with each other. For example, if you have a Nextcloud account from your company and your friend has one from her university, you can still easily share files as if you are on the same Nextcloud server. 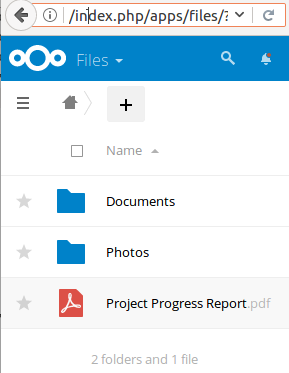 Furthermore, other file sharing solutions like Pydio and ownCloud have implemented the same sharing protocol as Nextcloud, so that you can exchange files with users of those platforms, too. In addition, Nextcloud supports password-protected public shares; something that Dropbox only offers to its paid customers. As security expert Bruce Schneier says, security is a process, not a product. Therefore, while there is no such thing as a perfectly secure product, there are ways to get more protection. With Nextcloud, whether you sync your files to your very own private server, or you use the service of a local provider, your data is stored outside of the big centralized services which are very attractive targets for malicious hackers and oppressive governments alike. There you have it. If you want to try Nextcloud, head over to https://nextcloud.com and get started today.